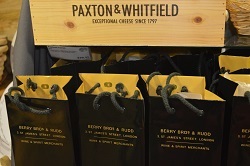 Towards the end of June this year, a group of people were lucky enough to take part in an informal tasting at Paxton & Whitfield’s iconic shop in Jermyn Street for an evening of cheese and sherry discovery. 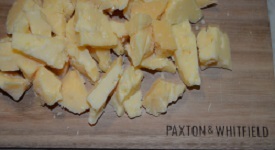 Delicious artisan cheeses were introduced by Paxton’s Hero Hirsh while a selection of artisan sherries were presented by Richard Veal, head of events and education, from renowned wine and spirits merchants, Berry Bros. & Rudd. Although clearly a poor second to actually attending the event, below are the pairings suggested by the experts at the evening allowing you to recreate the event in your own homes. The first pairing was Manzanilla and Dorstone. Richard chose En Rama, Manzanilla Sanlucar de Barrameda, Lustau 2017 to accompany Dorstone, a creamy goats’ milk cheese rolled in ash, with a slightly salty, lemon flavour. With its name figuratively meaning “raw”, the sherry is in its natural state, as close to possible to straight from the cask. It has a beautiful straw colour and a nose that is intense, fruity and complex. Aromas of sweet apples and cake dough can be detected amongst notes of quince, hay and camomile, while flavours on the palate are salty and fresh with a pleasant acidity. Next to be paired was Berry Bros. & Rudd’s Fino with Mahon. Matured by the famous house of Emilio Lustau in Puerto de Santa Maria, sea air, yeast and green apples on the nose lead to a palate marked by its smoky gravitas. 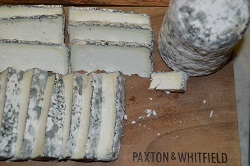 It is a great match for the PDO protected cheese, Mahon – a raw cows’ milk cheese from Menorca. 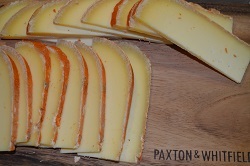 With a beautiful russet red colour, the rind is rubbed with a blend of butter, olive oil and paprika lending the cheese a unique taste and peachy aroma. Amontillado and Gouda were next. An aged example of Holland’s famous washed curd cheese was matched with an Amontillado especially blended for Berry Bros. & Rudd by Bodegas Emilio Lustau and classically aged in Jerez de la Frontera. Complex malty hazelnut flavours from the sherry complement the delicious sweet, nutty tones of the cheese, framed by the lovely crystalline crunch resulting from its 2.5 year maturation period. Oloroso and Comte were next on the line up. The Berry Bros. & Rudd Dry Oloroso, Sanlucar de Barrameda has a nose suggestive of walnuts and dried fruit and yet delivers a far drier experience on the palate. 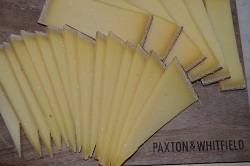 Partnered with Comte, hand-picked by Paxton & Whitfield’s French partner fromagerie and matured by 5th generation affineur Marcel Petite, the wine is perfect against the cheese’s rich, complex sweetness and subtle nutty tang. 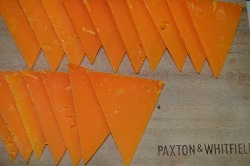 Nearing the end was the perfect pairing of Moscatel and Mimolette. Mimolette is made in the countryside near Lille in northern France and is famous for its dry, lunar rind, pitted by the intentional introduction of cheese mites which by nibbling on the rind, continuously expose more of the pate to air, expediting maturation and the development of its unique salty, sweet and caramel flavours. This provided a stunning accompaniment for Emilin Moscatel, Solera Familiar by Emilio Lustau which is billed as the perfect sherry for puddings such as fruit salad and fruit cake. Marmalade and orange peel notes front a seductive freshness with dried figs and molasses flavours providing depth to its refreshing character. And finally, Pedro Ximenez, San Emilio, Solera Familiar, Emilio Lustau was matched with Fourme d’Ambert. Described as “Darker than night and richer than Croesus”, the sherry is made with Pedro Ximenez grapes which are sundried to concentrate the sweetness to create a thick, dark grape must with intense flavours of raisins and molasses which is then fortified and matured in solera. 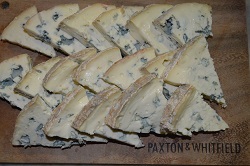 The sweet nature of this is the perfect foil for Fourme D’Ambert, whose mild, fruity flavour and gentle salty tang come from the farms of the Monts du Livradois and the Forez plain of Auvergne in central France. 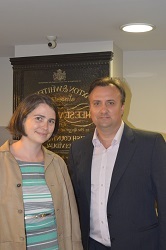 If you are still smarting from having missed such an informative and specialised evening, why not check out the following links where future events by Berry Bros. & Rudd and Paxton & Whitfield can be found.